Planning to spend your Christmas in the Philippines? These hotels are offering exclusive promotions that make them the perfect holiday hosts! Christmas is now in the air! With that, I’m sure spending it somewhere cold and glistening white would sound perfect, right? Nevertheless, celebrating this special holiday is all about being with your loved ones, and where else can you feel the best season’s love than with the warm company of the Filipinos? Thankfully, these hotels are all prepped to make sure the celebrations this year are really ones to beat! Home to the first and only waterpark in Puerto Princesa, the rustic yet modern Astoria Palawan is everyone’s paradise when it comes to all things fun and eco-friendly in the world’s most beautiful island. Prepare to be surrounded by lots of mangoes and stunning natural landscape once you enter the premises. This is truly a unique holiday experience in the Philippines! Do check out Astoria Palawan on TripZillaSTAYS to get a glimpse of what this one-of-a-kind Palawan property has in store for you. What’s more! Astoria Palawan will make your holidays even more special with its Christmas Came Early promo. For a limited time only, get as low as 25% off on your booking for a stay between 16 Oct and 22 Dec 2017. Hurry, book this exclusive offer and have yourself a merry EARLY Christmas in this peaceful enclave of natural wonders. Why go for a white Christmas when you can experience a rare sunny and refreshing one at Club Paradise Palawan in Coron, Palawan? The top-rated exclusive resort offers a true island experience like no other with its tropical vibe, outdoor water and beach activities, the amazing array of seafood dishes – all these and more simply make for an interesting holiday be it with your special someone, circle of friends, or the entire family. Check out Club Paradise Palawan on TripZillaSTAYS to learn more about this tropical paradise in Coron. Guess what? Club Paradise Palawan has prepared a range of Christmas 2017 offers exclusively for you! 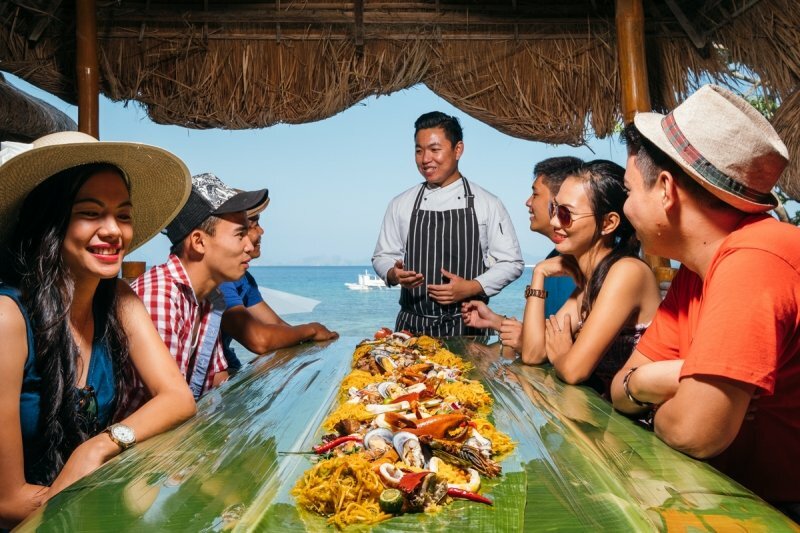 Your taste buds will be in for a real treat with its 12 Flavors of Paradise, The Sweet Kitchen and Yuletide Boodle Fight. Then, top those off with a gorgeous Noche Buena and Christmas Day spread, and even share the love through the Holiday Merienda for a Cause. Finally, give your body all the pampering it deserves with the Yuletide Retreat at Glow Spa. What are you waiting for? Grab these irresistible offers and have a smashing Christmas retreat with your family and friends! With the recent launch of Makati’s annual Festival of Lights, the holiday spirit has truly embraced the country’s biggest business district. Adding to the celebration is Makati Diamond Residences bringing along a variety of special holiday offers in its bleisure-centred features. While it’s famous among business people, the hotel also provides an environment for guests seeking a memorable holiday, from a restaurant serving a variety of Asian and Continental cuisines down to its easy access to the city’s colourful Christmas destinations. Makati Diamond Residences is offering exclusive offers to make your holiday season extra special. With their Holiday Haven (Promo Code: XMAS 2017) and Welcoming 2018 (Promo Codes: NYE2017 or SALVO2018), you’ll get a chance to celebrate in comfort and style in either their Studio or One Bedroom Suite along with access to different amenities and perks. 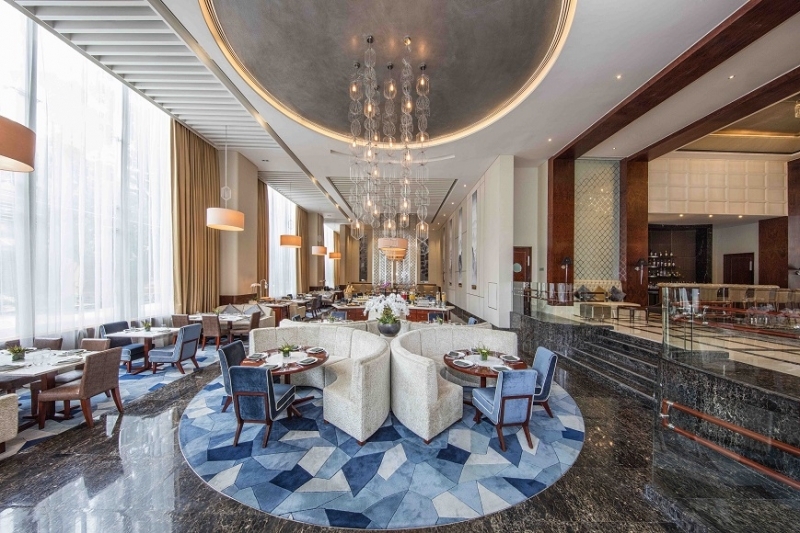 A festive brunch and evening buffet also await on Christmas Day and the Eve of 2018 at Alfred restaurant by availing the Brunch With Santa and New Year’s Eve Buffet. Holiday Inn & Suites Makati is best known for its kid-friendly environment, providing safe and direct connection to Makati's shopping and entertainment centre, Glorietta, and offering free services exclusive for children. 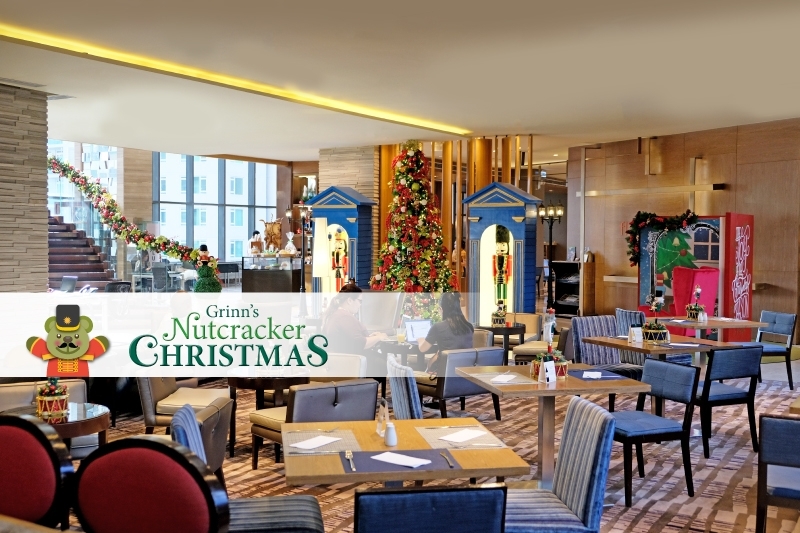 It is with this nature that the hotel is also staging a celebration with a touch of youth through the GrInn's Nutcracker Christmas, inspired by everyone's favourite holiday story, The Nutcracker. Learn more about Holiday Inn & Suites Makati on TripZillaSTAYS. For both the eve and actual day of Christmas and New Year, Holiday Inn's very own Flavors Restaurant will be filled with scrumptious holiday delights and cocktails that will take you to a gastronomic trip across the world, helping you forget about all your worries even for a short time. You can join in the New Year's countdown at the Oz Bar along with your party hats, poppers and noisemakers while enjoying some light treats and live music! The hotel also offers a Christmas Package which includes free gift certificates and photo booth sessions good for the family and relatives so that you may enjoy the warmth of the season altogether. Celebrate even longer by staying in a Deluxe Room, Club Room or Corner Suite at a discounted price valid from 1 Dec 2017 to 7 Jan 2018. Lastly, spread the season's love by bringing home some goodies, which come in large hampers, and sharing it to the rest of your loved ones! Whether it’s chocolate, wine, carols or trees, The Peninsula Manila has gone above and beyond to make sure we’re all completely pampered during the holidays with its holiday offerings. Start by witnessing the lighting of the hotel’s 45 ft Christmas tree, then get a chance to be one of the lucky guests to receive a special gift at the infamous Advent Tree. 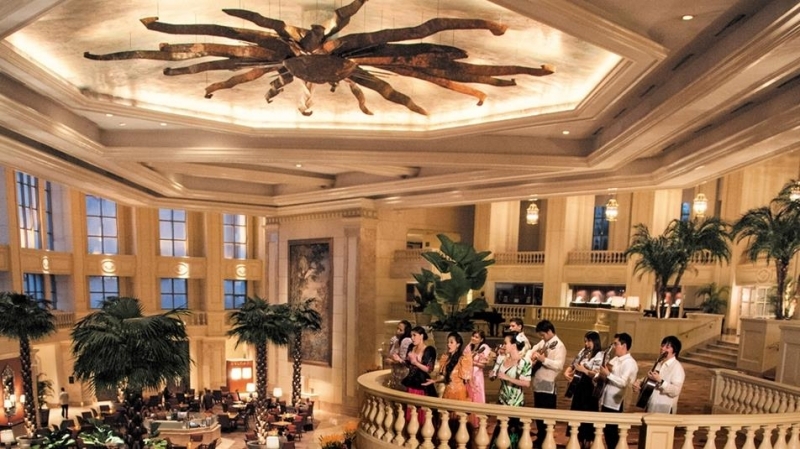 If you don’t mind listening to carols by choirs from different parts of the country, just head over to the lobby every night and be mesmerised by their voices. Take it up a notch by watching the traditional Christmas concert with a noted guest conductor and featuring the Philippine Philharmonic Orchestra along with a few of the country’s finest talents. 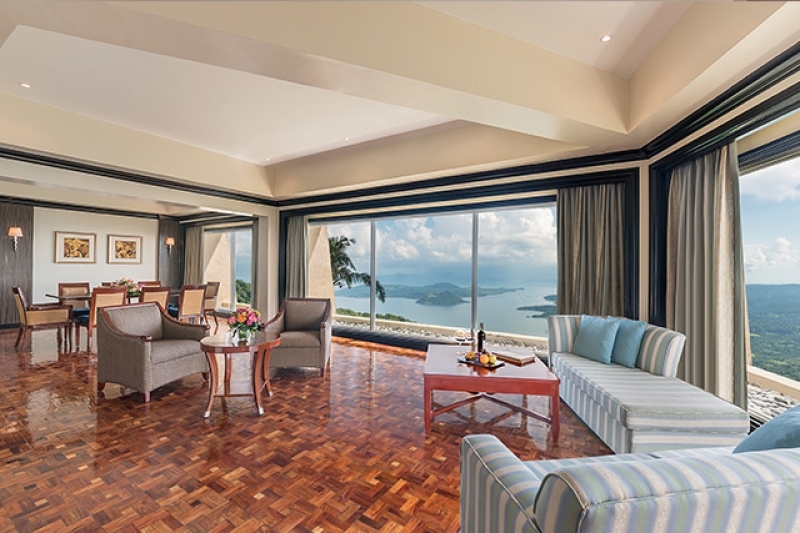 Tagaytay may be remembered more for being a summer destination in the Philippines, but it doesn’t excuse Taal Vista Hotel from bringing in the warmth with its exclusive Christmas Around the World offer. Have a meet-and-greet with Santa, be serenaded with Christmas carols by a choir and gather with the rest of the guests for Holy masses. The hotel’s restaurants Veranda and Taza Fresh Table will also be offering lunch and dinner buffets and a delightful Christmas eve feast. While the season is an obvious excuse to just dream away, why not use the time for fun activities? Fortunately, there’s the place called Chateau Royale near the Tagaytay-Batulao border, known to be the biggest integrated resort in the south that offers opportunities for rock climbing, rainforest trekking and team building. Its spacious indoor amenities are also ideal for big family gatherings, especially during Christmas. And speaking of that special day, the property is offering its Christmas Eve Promo that covers room accommodation, buffet breakfast and access to spa facilities, the gym, the wave pool and the clubhouse pool. You’ll also get a Noche Buena dinner with live entertainment at the Orchid Asian Grill and a tote bag. Share happiness, give love and spread joy. These words make up Marco Polo Plaza Cebu’s holiday message through its Festive Season 2017 special. Upon entering the lobby, you’ll encounter the hotel’s traditional Tree of Hope which lets you donate Christmas balls for the benefit of our underprivileged brothers and sisters. Hear the enchanting music of the Children’s Paradise Montessori Choir, get a chance to meet Mr. and Mrs. Claus as they give away gifts to children, munch on sumptuous holiday spreads at Cafe Marco, El Viento Restaurant & Pool Bar and Blu Bar and Grill, and enjoy your stay further with exclusive room packages for a festive getaway. To end that vacation with a bang, the hotel presents its New Year’s Eve Countdown Party at the Grand Balcony featuring Deuce Manila, top local DJs and a brilliant fireworks display! 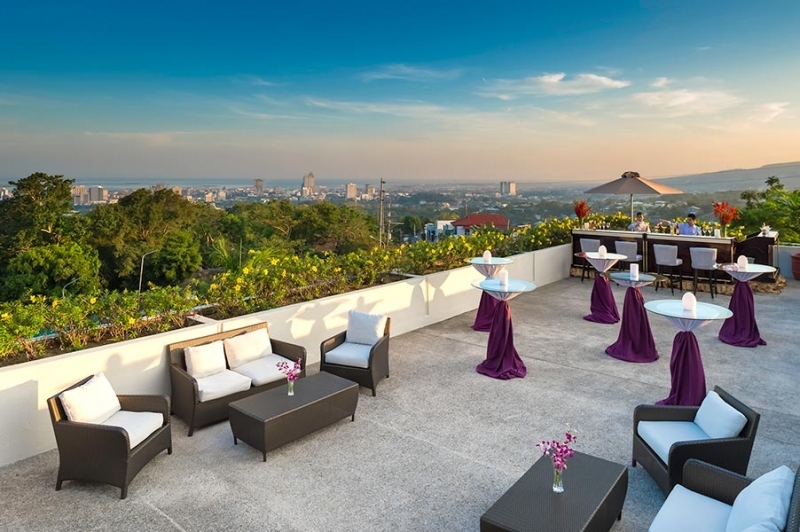 Right in the centre of the Queen City of the South lies the five-star Radisson Blu Cebu, a 400-room property that gives sweeping views of the Mactan Channel and the city, and easy access to the province’s most prized cultural and natural attractions. It is also home to one of the most outstanding MICE facilities perfect for the grander events this season. More importantly, it now offers 30% off on its rates thanks to the Rock the Season holiday promo, particularly if you are Club Carlson member, as well as the chance to receive additional 1,500 bonus gold points. With the members enjoying more discounts on food and beverage at participating restaurants in the hotel, you’re as good as getting a FREE all-in getaway this season! Whether it’s in the high-spirited Manila or the more serene lands of Palawan, celebrating Christmas in the Philippines is definitely one to look forward to. So without further ado, choose your destination and let any one of these hotels be your home this season! Need more ideas on where to spend an unforgettable getaway in the Philippines? Check out TripZillaSTAYS now!